What many individuals don’t realise, is that there are many different positions within the e-sports industry which need filling. For those who are really not into the actual gaming, there are still ways that they can enjoy what this industry has to offer to the workplace. Each of these positions plays a vital role in e-sports. Added to the list are the gaming software providers, which is an industry of its own. It too is one that creates a lot of job opportunities. Having some experience in e-sports on any level is a good start for an individual, who wishes to pursue a successful career in this industry. Keeping company with those who are already working in e-sports is a good starting point. These individuals are often aware of job openings, as they are already involved in the industry. At first, it may be worth taking any position which becomes open. After a while though, to really build a successful career, it may be better to pick one of the many areas within it and specialise in this. Working for nothing, or volunteering is a short term suggestion. It is a way of getting your foot in the door. Eventually, paid positions should become available, which will make you a likely candidate for it. 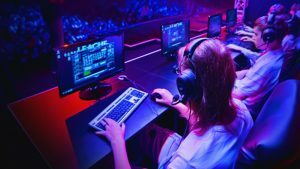 Before making any decisions about taking on a career in e-sports, time should be taken to learn about the different areas of potential work which it possesses. This can be done through observation. When going to an e-sports event, be alert as to what all those who are involved in it are doing.